Reports say Sen. Vicente ‘Tito’ Sotto III plagiarized portions of his anti-RH Bill speech from a foreign blogger. The comedian/politician denied the allegation and challenged his detractors to prove the existence of the blogger by showing her birth certificate. Sarah Pope, a foreign blogger confirmed that portions of Sen. Tito Sotto’s speech were plagiarized from her work. This just in: Sotto confirmed that his speechwriters used to work for Manny V. Pangilinan. Sen. Tito Sotto reportedly plagiarized portions of his speech from a blogger. Sotto is now in the running for Associate Justice of the Supreme Court. On national television, anti-RH lawmaker Tito Sotto denied plagiarizing the work of a foreign blogger. Sotto’s speechwriters declined to be interviewed saying they’re busy updating their resumés. 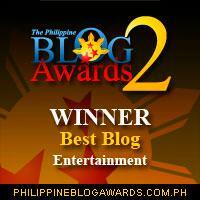 Sarah Pope of the blog The Healthy Home Economist” confirmed that Senator Tito Sotto plagiarized her blog. 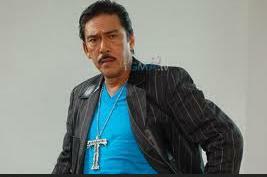 Rumors say Sotto is drafting a letter of apology soon. He’s just looking for a template online. A bill that seeks to expel members of Congress and their staff who will plagiarize the work of bloggers and online writers was filed earlier today in the Lower House. The Anti-Copy/Paste Act of 2012 was authored by Shariff Kabuktutan 2nd District Representative Loreto Dasig. Senator Sotto was quick to dismiss the bill as a form of harassment and vowed to block its passage. Update: After Sotto’s vehement denial that portions of his speech were plagiarized, his chief of staff ADMITTED that they indeed COPIED portions of Pope’s blog. Lawyer Hector Villacorta explained it was them not Sotto who copied it. Worse, Villacorta was arrogant in his “apology” to the blogger. Last Wednesday, convicted killer Rolito Go was reportedly “abducted” inside the New Bilibid Prisons. Yes, “abducted” in prison. In other news, Elvis Presley is still alive. Road rage shooting convict Rolito Go said, “I was abducted.” Bureau of Corrections Chief director Gaudencio Pangilinan insisted “You escaped!” Abducted, escaped, whatever, Pangilinan, you’re fired! MMDA traffic enforcer Saturnino Fabros filed charges against Robert Blair Carabuena who assaulted him Tuesday. If convicted, the Philip Morris HR manager could face up to six years in jail. Or less – if an abduction would be successful. PDP-Laban president and senatorial aspirant Koko Pimentel has accepted President Aquino’s invitation to become a guest candidate of the Liberal Party. Pimentel is really excited; he can’t wait to campaign distribute relief goods with the President. GOTCHA! One lazy afternoon many years ago while surfing with the tv remote button, i happened to see an old b&w hollywood movie just as when one lady was telling another, “you’re nothing but a second-rate…”, exactly the phrase attributed to Orlando Nadres and Bernardo2(?) used in the movie ‘bituing walang ningning’. I had an AHA! !moment, you bet. You’re so hilarious as ever!!! Bless your heart always. “You’re nothing but a second-rate trying hard copy-paste!” Hahaha! Very nice! Plagiarism is a serious offense. But this blog post make it sound so funny! 🙂 Kudos to you professional heckler! Sir, pakicheck naman kun speechwriters nga gumawa nung speech ng good senator natin. Hinala ko gag writers e. hahaha! Blogger lang?? yabang din nito ah. sotto’s pathetic attempt at an apology to blogger sarah shows how uneducated him and his staff are. i thought it was a spoof letter. no wonder they cannot write speeches and have to steal. once a cheat, always a cheat. someone should check his university dissitation. But of course, he graduated from Wanbol University. sorry, but i have the highest values in myself, and only then can demand it of others. at tsaka common sense naman, alangan namang original kay sotto kanyang mga pinagsasabi, bakit, doctor ba si sotto? does plagiarism apply to jokes too? should comedians stop after (or before) every punchline to give credit to the author? have you heard this joke about… aah forget it, i don’t know the author and might be charged for plagiarism. 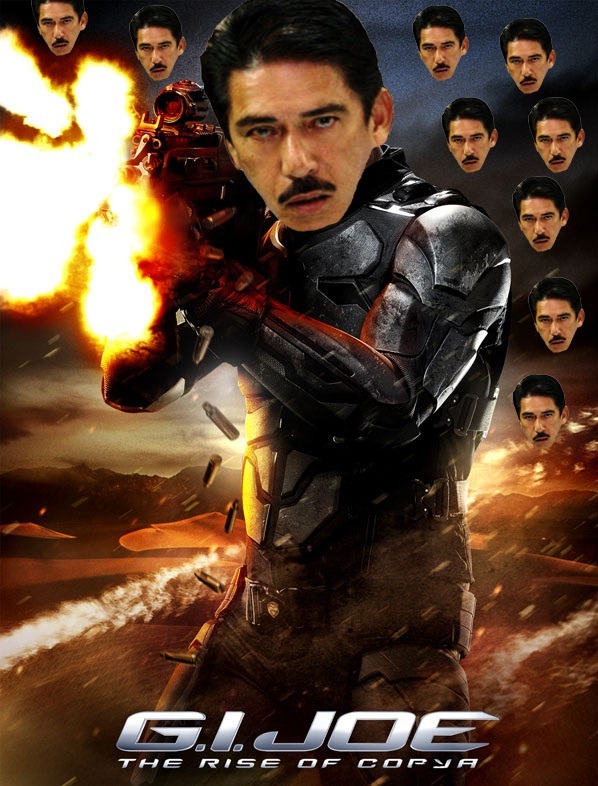 Somebody make that a shirt with Tito Sotto’s face on it. That’s going to sell. husay! you never fail to make my day ph! Obvious plagiarist kahit sa suot yan si Sotto or I’m not aware retro is in . Blazer w/ V-neck sando kopya kay Dan Johnson from the 70s hit TV serries Miami Vice and the oversized crucifix from the 80s Madona. What I’d really like to say to Ms Sarah… lam mo actually our people are not that hard up for something original to say. In fact most Filipinos I dare say are one of the creative races in this planet. What our poor country is really hard up to are politicians who would have something intelligent, relevant& ORIGINAL privilege speeches combined with the sincerest heartfelt service of our politicians. Not just bandying around crocodile tears and large named initial blings.. di mo maintindihan kung RAPPER or ROB_ER. To think they esteemed themselves in placing “honorable” titles in front of their names… PLUEEZEEE! If Atty. Villacorta, Chief of Staff, cannot even proofread his arrogant & pitiful attempt of an apology, it is no wonder the rest of the staff of Sen. Sotto would need to steal words from a blogger. It is also the pits for the Senator to continue denying he copied from a blogger just because it was his staff who did! Amazingly stupid! 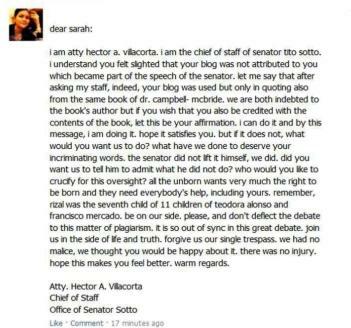 blogger sarah replied to sotto’s chief of staff, quite rightly expressing her indignation. if this is true, they make matters worse and make the senate a laughing stock internationally – we already know that. I understand sotto still has 2 more dramas to enact in the senate next week. If he just publishes the bloggers references in advance then he can spare the senate and the public his crocodile tears and bad acting. The good thing is that the unprincipled and bumbling sotto has convinced even more people to be pro RH. As a spokesperson he is on a par with ricky calamityagain. people by trivializing their mistakes. The same thing GMA trivializes her infraction by saying “Sorry” in the national television, however insincere she was. Mind you, stealing the vote is not trivial. she have to be accounted for. Much the same as Tito Sotto, Hector Villacorta, and his good staff. They should be accounted for whatever their actions is. Afterall, they are being paid by TAXPAYER’S MONEY! I repeat, you guys are living luxuriously on TAXPAYER’S MONEY! Someone on facebook just made a meme out of your hilarious movie titles.. lolz! Sana may lumabas na Downfall spoof patungkol kay Sen Sotto.. ahahahaha! Sarah wrote what Sotto said based on HER understanding of the doctor’s writings. And Sotto copied this verbatim. matanong nga kita jacques dahil hindi ako sure sa mga bagaybagay, ang ginawa ba ni sarah, and that was to write her piece ” based on her understanding of the doctor’s writings ” ay hindi plagiarism? kailangan ba copied verbatim to be? To begin with, the ridiculous senator had nothing original to say. His staff is even worse. A bunch of lazy pseudo professionals posing as speechwriters who failed to remember, GOOGLE. Shameless! ” isa kang malaking tanga at bobo ” wow naman mister heckler, ang sakit naman noon, in this particular instance for example, kailangan pa ba talaga ni sotto mag research sa kanyang sarili na baka nangopya kanyang mga writers? of course pinaubaya nya na lahat sa kanila..
Wag na kayo magtaka sa manners ni Atty. Villacorta. Atenista din ba yan si Villacorta gaya ni Barney the Purple Dinosaur Blair? Is plagiarism grounds for disbarment? Sotto blamed contraceptive pill ‘Diane’ for the death of his son. This is another blatant lie aimed to appeal to the emotion. Sotto said on karen davila the pill not effective with 8 – 10% pregnancies. Another lie/misinformation. The pill is 99.9% effective. Maybe sotto should speak again to his wife. I will never forget his this senator tried to ban Eraserheads. I hated him ever since. lies, damn lies, and sotto. Blogger LANG? Grabe nakaka disappoint. Basta mga ginoo?binibini, ako ay naaliw sa kababasa, all of you made my day lalo na sa iyo ph, Salamat ! So in effect, they’re not denying na kinopya nila….Ms. Villacorta, that’s not the way to apologize. To put it in the vernacular “Wala kayong karapatan na magreklamo dahil kayo and nandaya! Pa discriminate-discriminate ka pa dian. Pa crucify crucify ka pa” And you have the guts to drag Jose rizal into the issue. Sorry to say but you’re the one who’s out of sync. I wonder how his daughter would feel if her blog had been plagiarized. Then again, “ex-blogger” lang siya. Too bad it’s been deleted. Mr. Senator & your chief of staff, even students are required to do their own reaction paper, formal theme or sulating pormal in school. They are required to read, think and write their own ideas for them to pass or get high grades. Hindi ba mas nakakahiyang as someone who is a professional and a supposed leader, you can’t even write your own idea or speech? Worst, nangopya pa. I believe you have a personal take in this RH bill but looks like you’re not even hands on in the research or in the composition of your own speech. Parang mas kahanga-hanga pa si Senator Lapid for composing his own speech in the Corona’s Impeachment. At least it came from him and it was indeed his own idea and composition. They are not just mere bloggers, these people are thinking-beings and can come up with great ideas (original ones) by reading & researching, unlike you! excuse me lang Ms. Smile, may “original” ba na niresearch at binasa? hindi ba dapat pag sinabing original ay galing lahat sa iyo? I suggest Mr. senator always prepare your own speech. Do not let your office staff to do it for you. as Sarah Pope said, “your always responsible for your actions”. As i read your speech and the Sarah Pope blog the contents are all the same. Mr. Senator you committed Plagiarism which is punishable by law.